A middle age man returns to the scene of some childhood experiences and remembers (sort of) the experiences he thinks he remembers. “I remember my own childhood vividly … I knew terrible things. But I knew I mustn’t let adults know. I knew. It would scare them. Maurice Sendak – 1993. That should have warned me off but no … I didn’t pay that much attention. Chapter 0 (yes) tells us there is some difference between memory and reality here – unsure of the time frame. Then the Prologue deals with how grown man gets to the old house of his past. Chapter 1 goes back to man’s 7th birthday party when nobody came – his cat is killed and replaced, a man is found dead in their car, and he meets Letty Hempstock and her mother who live in a house at the end of the lane. On one outing with Lettie who appears to be about 11 years old – the boy gets a worm in his foot but doesn’t tell until it’s almost too late. The threats to the established order of things, which every child needs, start with the boy’s family and expand quickly. From there on the story is basically one of increasing threats to the universe by various evil forces through holes (worm holes) because the Hempstock women are very, very old and know how things “really” work. 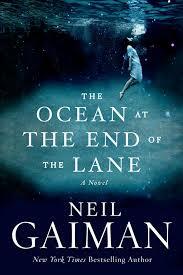 I’ve read one other by Gaiman, Neverwhere, and it was better but I’m not a fan.